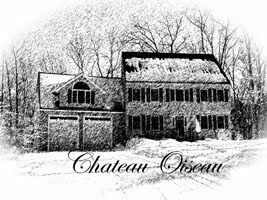 Chateau Oiseau: Finally Malolactic is finished! Well, after three weeks, the malolactic fermentation finally finished. The tiny bubbles trickled off to nothing and it was time to rack the wine off the lees (sediment) and allow it to chill down in the cellar, which is now 55 degrees in the dead of winter. Given the pH of around 3.8, I added 50 ppm (1/2 teaspoon) of Meta (meta bisulfate) to the new, clean 6 gallon carboy, and then elevated the full carboy on a stack of buckets to begin racking. 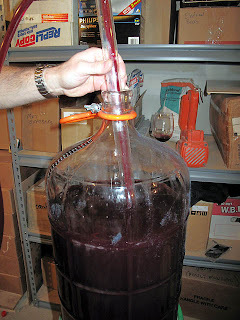 "Racking" is just a fancy name for the process of siphoning off the wine into another carboy, leaving the lees (sediment composed of dead yeast cells, grape chunks, etc.) behind. 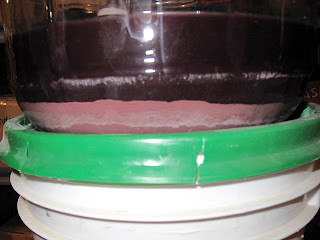 Of course as you leave some of the sediment behind, you also end up with a new carboy that is not totally full. 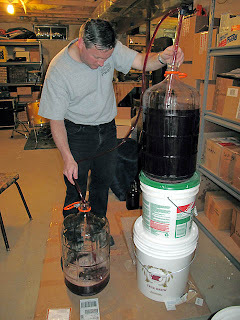 That's the reason I was cultivating another half-gallon jug of the excess wine that didn't fit into the carboy after fermentation. It is used to top off the new carboy. 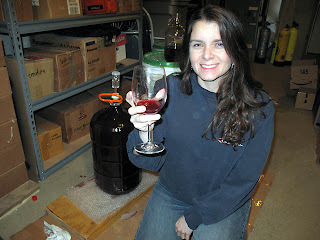 Christine helped with the process and took some pictures (note shot of the lees at the bottom of the carboy). Then we had an opportunity to taste a little bit of the wine. It's good! Fruity, quite drinkable, and simple as we have not used any oak yet.